You can configure a pencil's size as well as how much Harmony should automatically smooth your pencil lines when drawing. 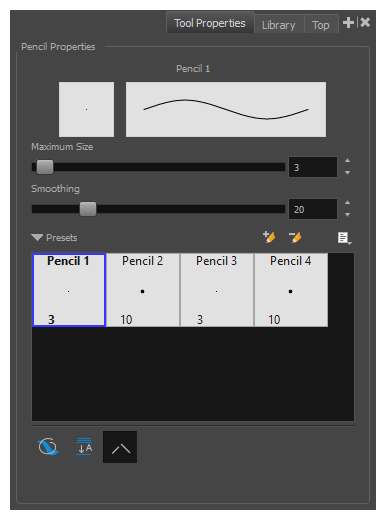 The Pencil tool properties appear in the Tool Properties view. Use the Size slider to set the size of your pencil line. Use the Smoothing slider to set the amount of smoothing Harmony should perform on your pencil lines. A higher setting will prevent your line from being shaky, but is liable to reduce your drawing precision and to round sharp corners into curves.